Thought it would be fun to make a few vids and share my experiences so far. After a near 6 months wait and many delays, my Next Level Motion v2 arrived and so I'm racing again! I am still tweaking the software to personalise the experience, but rFactor 2 simply seems to have the best output of any I have tried so far and the feeling is fantastic with only a few tweaks. ISI have release the version 1.02 of my favourite rF2 car of all time that has been there since the early releases and it was long overdue the overhaul. All the previous annoyances, like the flickering wing mirrors have been addressed and you can even upgrade (or rather downgrade) to the 2009 version over the 2012 Trophy Evo edition which is standard. It's so nice to be back behind the wheel, I did try to keep racing once I sold my Geko GS 105C last September, but the whole thing felt flat. Once you have had motion, you never go back! The Megane is such a nice car to race with and I chose Mills Inner Loop C as this, along with the car, was my bench mark track way back in January 2012 when I purchased the lifetime online pass to support the development. I've also replaced the CSP v2 pedals with the CSP v3 pedals along with a set of dampers on the throttle and brake. The whole feel now is awesome in my limited space and I'm so glad that the wait for the NL Motion platform is working out. Anyway, time for some more laps! 2014-11-18 ~ A quick 5 lapper around Silverstone in the United Racing Design Darche EGT (Porsche 991 RSR GTE) against the rest of the URD EGT series. Those AI are a dirty bunch so had t play them at their own game although their strength at 100% seemed to lack some stamina and had I not made a few silly mistakes, they would not have caught up with me. I was going to follow it up with the AC comparison, but URD are updating the sound amongst other things and it's not quite ready for a video just yet so I'll do one next week ... or the week after... or the week after that... or whenever URD's work is complete! I'm hoping to go round Silverstone in an open wheeler next year with my twin brother to celebrate our 50th Birthday so need as much track time as possible to learn it well... can't have him beating me can I? 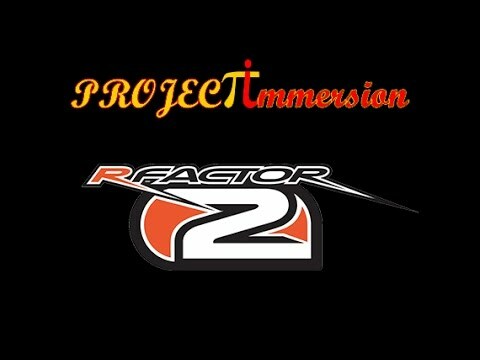 2014-09-21 ~ I dusted off rFactor 2 again this week to try out the new build with the latest motion seat 64bit plugin from Geko Syetems. My tools of choice for the job were my recently acquired Fanatec CSW base and the BMW M3 GT2 rim along with CSP v2 pedals. The field was populated by United Racing Design's EGT collection for rFactor2 and I chose the Bayro to sit in for the journey and pitched against the rest of the EGT pack. It was a challenge that's for sure and I nearly stuffed up a few times around Maggots and Becketts but I won in pulled away in the end... just! I'm really enjoying the Fanatec gear, it's definitely a step up in the quality/build arena, and a step forward in the immersion for me with most details shining through (although a lack of subtle detail around the centre compared to the T500RS I'm used to). The FFB is as strong as an ox though, so needs to be tamed to avoid clipping and loss of feel past the extremes quite often. United Racing Design have really hit the mark with the EGT series. I wasn't too keen on the T5 series mod they release previously, but now I'm on 64 bit rFactor 2 I can really appreciate a fuller field properly and the driveability and fun factor is right up there with the best of the modders... worth the fee in my opinion, although I don't usually like to pay for DLC or Mods out of principle, these guys seem to know their stuff and I have no problem paying for it. 2014-08-24 ~ ISI have updated a few GT cars just recently so I bolted on the H-Shifter and grabbed the GTR for a day and a night race. It's great fun to drive in a mixed field and Mid Ohio is a good technical track to put me and the Nissan through our paces with some slippery curbs at the Keyhole and the Carousel, the former catching me out on both races as I got greedy for undertakes. The GTR has plenty of grunt and can spin round easily if the load pedal is pressed too urgently, so plenty of control is required, but the new version of the car is far more stable than the original and the last update that's for sure. With thanks and appreciation to Next Level Racing for their help and support with their Motion Platform, Next Level Racing Motion v3.